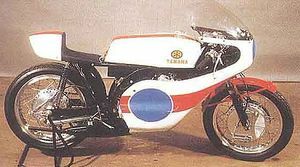 1973 saw the introduction of the bike which was about to transform the 350cc GP class worldwide, the incredible Yamaha TZ350A. The inclusion of water-cooling in addition to other slight improvements over the bike's air cooled predecessors, the TR2, TR2B and TR3, saw Yamaha's 350cc production offering fast becoming an almost unbeatable weapon in the hands of the right rider. This boosted horsepower from ~55 to 65 horsepower, but most importantly it could sustain that power throughout the whole race. Internally the motor hadn't changed much from the previous model apart from the widths and angles of the transfers being altered to improve scavenging, though actual port timing remained as it was with the older model. Also the silicon content of the cylinder was lower compared to that of the TR3's separate hypereutectic units. The new bike produced a very respectable 60bhp @9,500rpm. Interestingly, there was no variable advance built into the Hitachi TIA02-01 CDI controller used on the 350. Whatever ignition advance the tuner set was the advance right through the rev range. ( This was not the case with the TZ 250 ). To make a good showing at the Daytona 200, Yamaha sent their top rider, Finland's Jarno Saarinen, to ride the new bike. 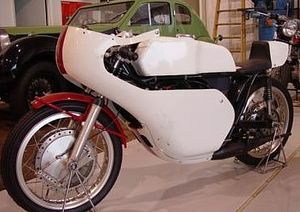 Tuned by Kel Carruthers, Saarinen rode this machine to victory at Daytona at his first attempt. The steeply angled clip-on handlebars were Jarno's trademark, a legacy from his ice racing days. The "C" model, of 1976 was another matter entirely. Here was a radical departure chassis and running gear wise from the earlier TZ's. Adjustable "mono-shock" (spring preload and compression damping only) rear suspension, combined with twin piston front and rear disk brakes set the world on fire, with the new bikes selling like hot-cakes from Yamaha dealers worldwide. The retail price of around £ 1,550 including a comprehensive spares kit was incredible value for money and did no harm at all to sales. The clutch basket "boss" was improved by changing it's method of attachment to a male / female spline system from the previous model's "dog" type. The exhaust header picked up an additional o-ring and a new mounting system. Power jumped up slightly to 62bhp @ 10,000rpm. 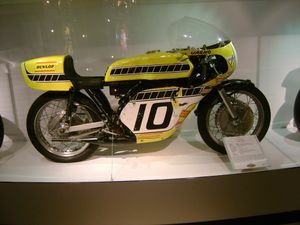 What is essentially a TZ350E on display in the Macau Museum. This bike has an F model top end, Lockheed calipers and magnesium wheels. It also has the gear shift foot lever fitted to the right hand side of the bike indicating that possibly a British rider may have raced it at Macau. Minor porting, piston and exhaust upgrades saw the peak horsepower output up by 2 to reach a claimed 64bhp @10,500rpm. The factory also chose to fit an offset, angled plug head with the "D", in an effort to combat cylinder and piston distortion as well as slightly raising the compression ratio. New expansion chambers were now fitted from the factory with removable silencers. Small changes were also made to items like the base gasket, crank webs, small end bearings, the gasket for the side oil draining bolt on the gearbox, carby floats and choke systems etc. Tyre widths were also increased from the factory though rim sizes remained as per the previous model. The "E" had a new frame which re-positioned the engine slightly more forward featuring detachable alloy engine plates and around 20 other additional bolts, nuts, washers etc. as well. The swing-arm length remained as for the "D" as did just about everything else apart from the rear lower engine mounting bolt which was lengthened by 5mm. . The provision of a new "6 port" cylinder, with subsequent improvement in rideability, with an improvement in peak power output to boot. Also new "cross-over" style chambers to keep the muffler tips within FIM requirements length wise and a new piston. The "F" pistons were the first of the short pin "slipper" type but the side windows didn’t have the support web running down the middle, and the ring sometimes pulled the edge of the piston down into the window. A new conrod, which was lighter, but turned out to be prone to failure ( due mainly legend has it, to the wrong silicon content in the pistons causing them to wear and deposit aluminium on the small end bearings causing them to fail and take the conrod with them ), plus a new "3G3" piston to suit the new cylinder. 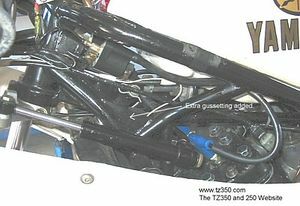 The inclusion of 38mm "Powerjet" Mikuni carburettors to further enhance the new engine's usability through the ability to fine-tune the midrange mixture more effectively and also reduce the risk of seizure at high rpm, while actually contributing to the increase in peak output at the same time. A new, revised, lighter weight frame, which had a bad tendency to fail around the headstock, which is why so many of them were re-inforced in this area, or had aftermarket frames replacing the Yamaha items. New forks featuring 3-way adjustable spring preload via. an external adjuster on top of each fork tube, as well as revised fork internals designed to reduce the front end "patter" being experienced by a number of 350 riders. A new fairing which dispensed with the separate belly pan and was a sharper shape at the bottom-front (behind the front wheel). The fuel tank was now a tapered shape to match the sloping upper frame rails and the seat unit was changed to a more "current" shape. Minor changes included: the cylinder drain pipe, inner main bearing circlip/washer, gudgeon pins, introduction of an oil level "dipstick" and new ignition pulser coils, exhaust mounts, clutch cover and an additional o-ring was included in the exhaust header to assist sealing. Frame failures around the headstock area were a common problem with the "F" model 350's, for this reason a large number of owners chose to ditch the stock frames and replace them with units made by such manufacturers as Nikko Bakker, Bimota, Spondon, Maxton, etc. Others chose to reinforce the stocker with additional bracing such as that shown in the photo. 1980's TZ350 G was virtually the same as the previous "F" apart from another attempt at improving the conrod, reverting back to the older "E" inner main bearing circlip/washers, a revised piston silicon content as well as strengthening in the sides of the piston, and a different "dipstick". Another change was the way the ignition rotor was bolted on to the crankshaft. The timing side crank wheel had an external thread and nut, where the earlier models had the standard 7mm internal thread. 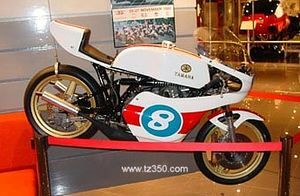 The 350 "G" was never really improved on, despite Yamaha releasing another model, the "H", which was really just a case of the factory using up a lot of it's stock of parts, giving up further production of the mighty TZ350 once the FIM dropped the 350cc World Championship class in 1982. 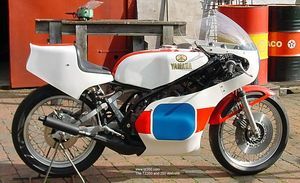 By the end of 1978 it was clear that Yamaha needed to revise the TZ350 if it was to maintain its dominant position in the 350 class, consequently for 1979 Yamaha introduced a considerably revised version of their hugely successful TZ350. Typed the F the new machine adopted a new, lighter monoshock frame partnered by an alloy box section cantilever swinging arm and three way adjustable front forks. The new frame housed a revised version of Yamaha's illustrious liquid cooled two stroke twin, now equipped with a 6 port cylinder producing a claimed 72bhp @11,000rpm. New, more aerodynamically efficient bodywork completed the overhaul. 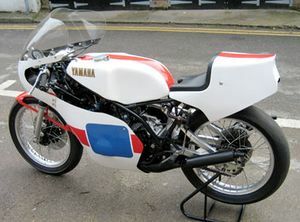 The following season saw the introduction of what for many is the ultimate TZ350, the "G", which built on the success of the "F". Few modifications were deemed necessary and those that were undertaken were largely in the interests of improving the machines already excellent reliability. The connecting rod design was revised and the piston strengthened whilst the ignition rotor mounting was modified. Original TZ350G are now highly sought after by enthusiasts. This page was last edited on 20 January 2011, at 18:19.